Possible configurations for the spin texture of a Bose-Einstein condensate. These defects give rise to a vorticity field that is equivalent to the magnetic field of a magnetic monopole. Credit: Pietilä and Möttönen. 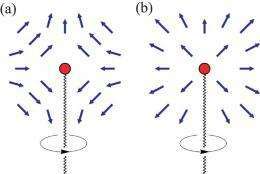 (PhysOrg.com) -- For decades, scientists have been intrigued by the hypothetical existence of magnetic monopoles - particles with only a north or south magnetic pole, thus having a nonzero magnetic charge. But while modern theories predict their existence, monopoles have not yet been experimentally observed, despite numerous attempts. Recently, physicists have introduced a new method to create analogies to magnetic monopoles, and predict that they could be observed with current technology. Ville Pietilä and Mikko Möttönen, both of the Helsinki University of Technology in Finland and the University of New South Wales in Australia, have published their theoretical demonstration in a recent issue of Physical Review Letters. Here, they explain how applying an external magnetic field to a Bose-Einstein condensate (BEC) - a large group of cold atoms that exhibits coherent quantum properties - can create point-like topological defects on the spin texture of the BEC. These defects give rise to a vorticity field that is essentially equivalent to the magnetic field of a magnetic monopole. “Since all experimental attempts to find magnetic monopoles have proven to be futile, there is no experimental evidence supporting the existence of magnetic monopoles,” Pietilä told PhysOrg.com. “Other types of monopoles without the Dirac string have been realized in experiments already in the early ‘90s in liquid crystals. An analogy of the real space magnetic monopole was reported to occur in the crystal momentum space of a metallic ferromagnet, but the experimental evidence in this case is somewhat indirect. Dirac monopoles in the more general settings are predicted to occur in various systems such as superfluid Helium-3 and dilute spin-1 Bose-Einstein condensate but so far there are no (direct) experimental observations although they may have been present in some of the Helium-3 experiments. There is also a very recent suggestion on how to induce a magnetic monopole to a band insulator. Pietilä and Möttönen predict that it should be possible to design an experiment to detect the monopole in this situation, if it does exist. As they explain, the magnetic field of the monopole is provided by a Dirac string, which is a line extending from the monopole to infinity. The Dirac string explains why the monopole charge comes in discrete quanta. Since the Dirac string carries two quanta of angular momentum, it is expected to be prone to splitting into two separate strings, each carrying a single quantum. Through modeling, Pietilä and Möttönen theoretically demonstrate that the Dirac string can be split into two parts by modifying the external magnetic field, which breaks the rotation symmetry of the system. In this case, state-of-the-art experimental methods that measure changes in particle density and spin density could be used to detect a signature of the monopole. In addition, in spin-1 BEC, the spin texture is topologically unstable, allowing it to be removed. Through simulations, the scientists show that removing the monopole could be done by turning off the external magnetic fields. The monopole “unwinds” itself along the Dirac string and leaves behind a closed vortex ring. The speed of the unwinding depends on how quickly or gradually the magnetic field is turned off. The existence of magnetic monopoles has far-reaching implications for many research areas, including the laws of quantum mechanics, theories of elementary particles, and cosmology. Experimentally confirming the existence of monopoles would provide long-sought evidence for some ideas, and possibly open up the doors to other new ones. I gave this a 5 because I learned something interesting.